Today we are all too familiar with the assault of digital information and various forms of media which work hard to blur the definition of reality. Robertson has created a world where that idea is pushed to its disturbing conclusion. On the Station, where the remnants of humanity orbit a toxic world, the rusted and mechanical environment is overlaid with the virtual world of the weave. This shiny facade makes life tolerable for the humans as they live under the benevolent protection of the Pantheon, AI “gods” born from corporate empires. Jack Forster returns home to this world, a prisoner of war, betrayed by those he fought for and trapped in the conspiracies of higher powers. But Jack doesn’t come back alone, sharing his mind for the ride is Hugo Fist, a deadly artificial weapon with attitude, together they’re going to find out the truth. 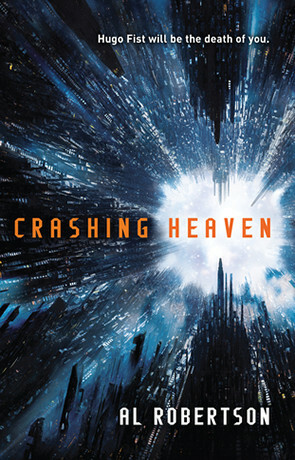 Crashing Heaven is a very different and interesting work of cyberpunk fiction. The world Robertson creates is immediately compelling, the idea of a slowly decaying space stain covered over by virtual reality is a great concept. As Jack is cut off from the weave at the start of the novel he sees the world for what it is and this view helps the reader to understand the lives of the humans who inhabit it far more than if Jack was part of the crowd. Everywhere Jack goes seems to be dilapidated and broken, a contrast with what other people see, lending the atmosphere a slightly sinister tone. The novel is obviously big on technology, examples range from weave adverts, rogue AI’s, flying cars and lots of virtual hacking. Many of the elements have interesting twists to them such as the religious overlay for the AI rulers of the station. The concept of the gods and their patronage is a very clever one that Robertson uses to express a number of aspects such as culture and politics. We meet a number of these digital deities throughout the novel, their characters are well crafted and Jack’s interactions with them are always intriguing. The gods are just one of the interesting technical innovations of the book, another example is the fetch, data ghosts made from the weave footprints of the deceased. These haunting entities again add a darker tone and prompt some philosophical musing on the nature of life and sentience. Despite much of the action taking place in the virtual space, Robertson manages to make every hack interesting, there are some great action scenes dotted throughout the novel as Jack goes up against powerful characters in his search for the truth. Backing him up is the puppet construct Hugo, this artificial intelligence is probably the best written character in the novel, his personality and callous attitude provides moments of humour and entertainment as the story progresses. The two have a very interesting relationship that teeters from dysfunctional to surprisingly tender at times. The plot has a noir feel to it, detective work and mystery spliced with high technology. There are certainly enough threads to keep the reader guessing as Jack works to uncover corruption and strike back against his foes. The writing is skilful and paced well, the prose flowing nicely without slowing down the narrative. When it comes to characters there’s a wide range of different personalities, even from the AI’s, but I did feel that Jack was a bit generic and underdeveloped, there wasn’t really much to make him unique as an individual. There are a lot of elements that makes this novel unusual, when the protagonist can make an escape by tweaking some code or boosting his charm output the narrative can take some strange turns. But the book is definitely worth a read, it’s got some very creative ideas that are woven into a complex and exciting storyline. It’s a bright new addition to the cyberpunk cannon. Written on 30th September 2015 by Aaron Miles.